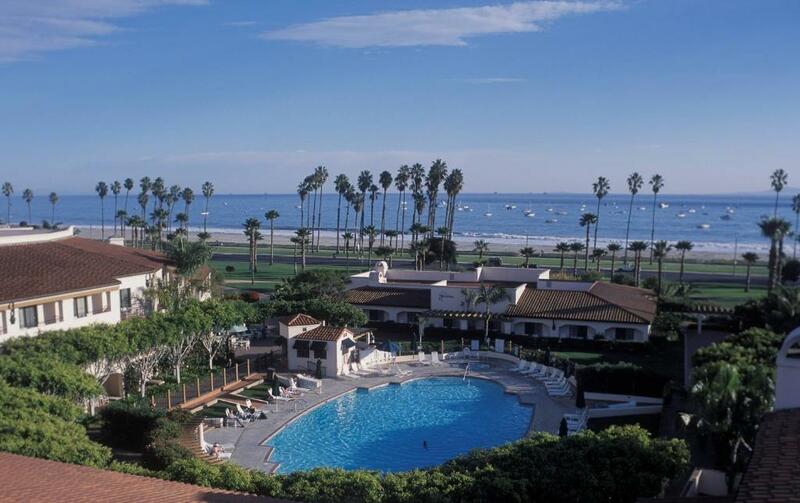 The Fess Parker DoubleTree Resort Santa Barbara surprised us with its beautifully manicured grounds, welcoming pools and public spaces, and clean, spacious, rooms. 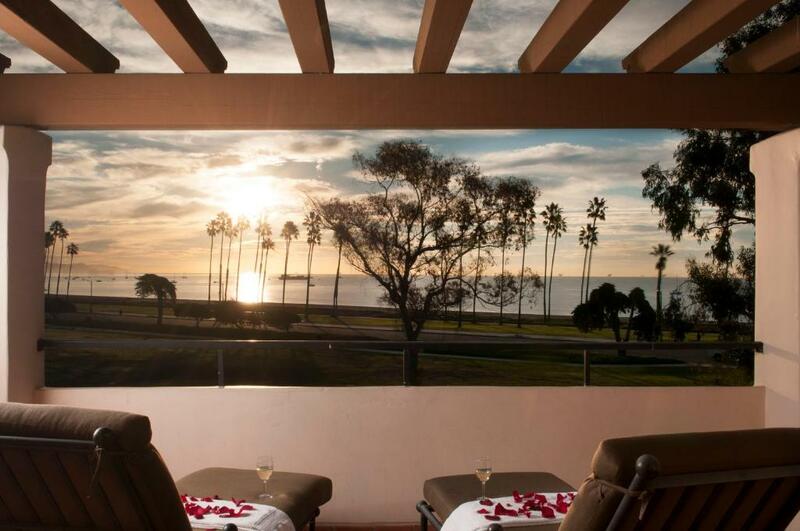 If you want to enjoy the beautiful Santa Barbara coast in a well appointed and relaxing atmosphere consider The Fess Parker’s beachfront location. 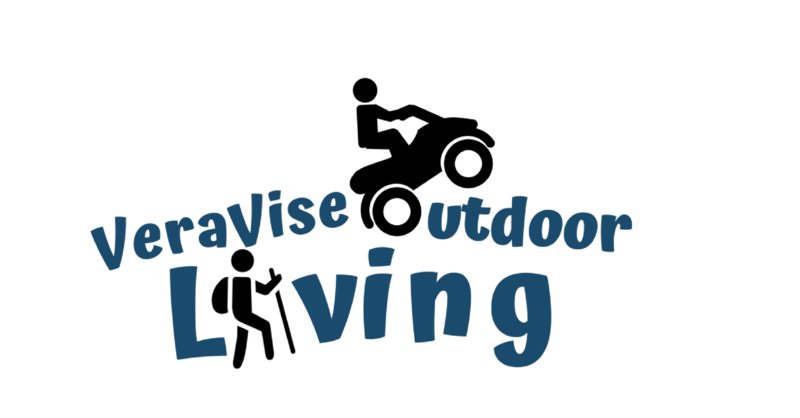 VeraVise found WOW in these accommodations, and we are pleased to share this guide with you. Use the heading links as a navigational guide through our hotel reviews. If you like our guides, please leave us a comment, subscribe to our newsletter, and check out our other hotel and restaurant reviews. Be sure not to miss our trip tips and itineraries. In my introduction, I chose the word surprised because, to be honest, my experience with DoubleTree hotels has not always been one of WOW. I was rather apprehensive about what to expect at The Fess Parker. However, the mother’s day rates in Santa Barbara were a bit out of my comfort level, so I chose the Fess Parker DoubleTree Resort in order to utilize my Hilton rewards points. We arrived after dark from our long drive down the Pacific Coast Highway. However, the moment I awoke the next morning and stepped out onto our balcony, I was in love. To my left the beach and palm tree lined streets compete for my attention with the magnificent Santa Ynez Mountains to my right. As an East Tennessee Appalachian girl, mountain ranges live in my heart. The mountains in Santa Barbara jut into the crystal blue sky creating a skyline much more punctuating than the soft rolling ranges of the Smokies. I now love them both! Both the external grounds and the interior public spaces of The Fess Parker were beautiful. Clearly a wedding destination, the attention to detail and decor was evident. Nowhere was it more evident than in the beautiful outdoor spaces. Arriving late is always a bit unnerving in a hotel, but as I said, we were pleasantly surprised. Our room was clean and well appointed. We had the King room with a pull out sofa which was large enough for our three children to comfortably share. The bathroom was a bit on the small side, but it was clean and had everything we needed for a two night stay. Unexpectedly, we received free breakfast certificates for The Roundhouse our second morning. We concluded it must’ve been a perk from our Hilton Honors membership, but could find no reason why it was only the second morning. We weren’t complaining! There was a mother’s day brunch being held later in the day, but we were heading out to San Diego and were glad to get on the road after our breakfast. The wait staff was very pleasant and made sure the chef came out to address our food allergies and walk my kids through the buffet. This always gets a vote for WOW from our family as it is sadly a rarity in many places. The made to order omelet station is always a nice touch for our family. We have food allergies and also try to eat a low carb lifestyle. It is a nice treat when we can have a hot breakfast that doesn’t include powdered eggs and boxed pastries. We spent a lot of time in town or sightseeing so we didn’t dine at any of the other restaurants, but The Fess Parker also offers a poolside lounge, Rodney’s Grill for dinner, Java dél Mar cafe, and an outdoor bistro called The Set. If it is coming from the same kitchen as our breakfast, I am sure they are all delicious. There is also a very nice wine tasting room . We, unfortunately, weren’t able to participate in it’s offerings, but I did find it pleasing to the eye. One thing I do love about the DoubleTree properties are the warm Chocolate Chip cookies received at check in. The host forgot to give me ours, but when we came back for them, the valet immediately went after them. He also brought out extra bottled waters. The staff were always pleasant, friendly, and helpful. I have no complaints regarding our experience at The Fess Parker. My family enjoys the old Daniel Boone reruns. It was fun to tell them we were staying in a hotel named after Fess Parker or as we know him, Daniel Boone. 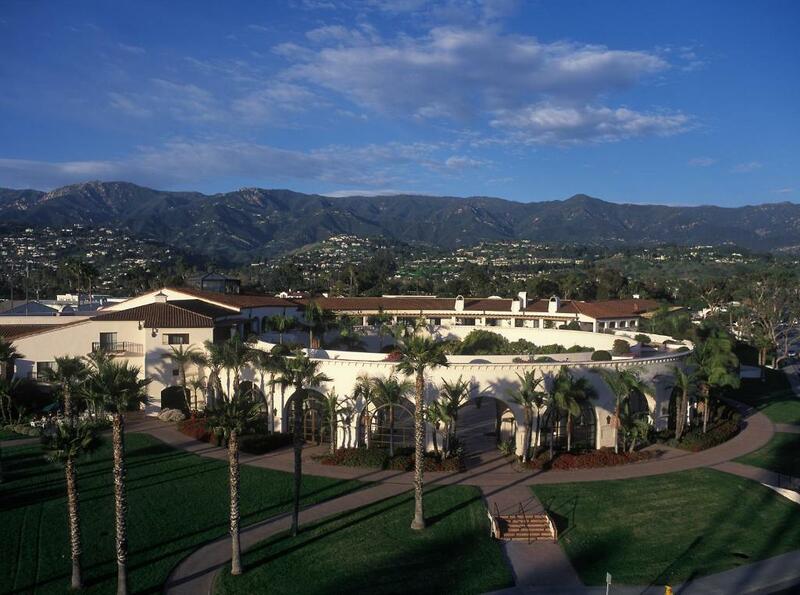 If you are ever in Santa Barbara and in need of a full service resort right on the beach, consider giving The Fess Parker DoubleTree Resort Santa Barbara a try. 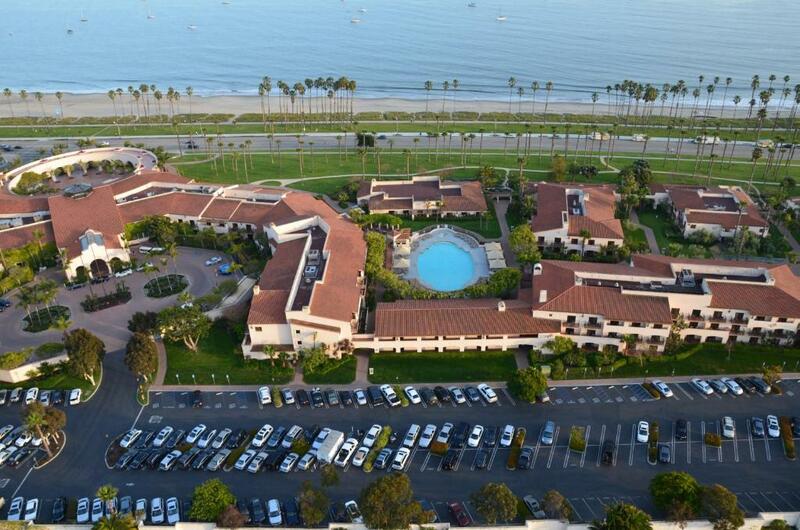 Great Location of the Hilton Double Tree in Santa Barbara. Love the location and the hotel grounds. Your view of the ocean is amazing. I will definitely have to add this to my hotel list next time I visit Santa Barbara. Thanks for sharing! #TheWeeklyPostcard. I have some family that live in Santa Barbara, and I will need to keep the Fess Parker in mind when I next visit them. Looks like a great place to stay with my family. I always like an omelet station at breakfast. And that warm chocolate chip cookie was a great gimmick that they came up with. I always look forward to it when staying at a DoubleTree. We’ve stayed at this hotel lots of times! We love Santa Barbara! Lovely photos! Lovely hotel! Will be stopping in SB on our Cali road trip one day so I can show my German husband how beautiful the town is. Thanks for linking up with #TheWeeklyPostcard! Thanks, as always, for stopping by and leaving a comment. I’m sure your husband will love it as we did! It is in a lovely location. I’m sure you would enjoy it. Great views!! I had no idea Double Tree also did resorts! So, it’s not actually an all-inclusive resort? I like the look of that restaurant!! No, it’s not all inclusive. Because it offers restaurants, pools, and other services such as fitness and spa services, beyond simply a “room”, I believe that is why it’s called a “resort” as opposed to simply just a hotel. It does look nice and so lucky you got the free breakfast. I wonder if that was to make up for forgetting the cookies! Thanks for sharing on #TheWeeklyPostcard. beautiful views. My friend stays in Ca. Have seen view glimpses of USA with her lens. I will probably be vising NYC soonish, Ca is not in near vicinity though ? Wow is right, those views are great! I love arriving to a hotel after dark; the anticipation of seeing the view usually has me up like a kid on Christmas morning (especially if the sound of crashing waves can be heard!) If I chicken out of driving down the Baja peninsula this winter, I will be spending a good deal of time in SoCal.